You may recall that last year I was involved with Neil Brand in a recreation of Lowell Thomas’ celebrated multimedia show, With Allenby in Palestine and Lawrence in Arabia, which in 1919-20 did so much to create the romantic idea of Lawrence of Arabia. On the Bioscope the research led to a detailed post on T.E. Lawrence and his life in film. The show had one barebones presentation at the British Silent Film Festival before it was decided not to take the project any further. But there are those with other ideas, and one of them is Rick Moulton, an American documentary filmmaker with a particular interest in the work of Lowell Thomas and his media presentations. Moulton and Clio History have now produced a website, Lowell Thomas and Lawrence of Arabia: Making a Legend, Creating History. It’s a handsomely produced site which tells the romantic tales both of T.E. Lawrence and of Lowell Thomas himself, the American journalist who went out to the Middle East in search of a heroic figure to sell the idea of the war to an American audience, and who succeeded in his quest beyond his wildest dreams. Billed as an exhibition, the site covers Thomas as journalist, T.E. 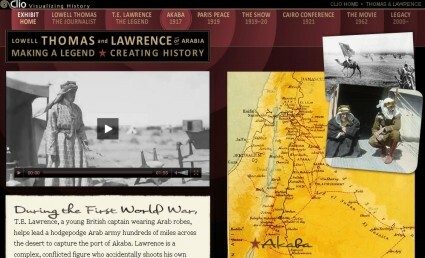 Lawrence as a legend on the making, the attack on Akaba, Lawrence at the Paris Peace conference in 1919, the success of the 1919-20 show, Lawrence at the Cairo conference (where the Middle East was carved up and parceled out), the 1962 David Lean film, and the legacies of both Lawrence and Thomas. The site has just the one video clip and some audio, but it is rich in images and supporting documents, and each section of the site has several sub-pages – there is plenty to explore in what is a site created in the spirit of Lowell Thomas himself. Lowell Thomas (1892-1981) was an American journalist who gained nationwide fame as a Movietone newsreel commentator, as co-founder of Cinerama, and as a radio and television broadcaster. He started out as a print journalist and adventurer, and it was a mixture of personal experience and drive that in 1917 got Thomas a commission to seek out material that would demonstrate to the American people why it was important to support the First World War. He found little of what he felt to be suitable material on the Western Front, so with British official support he went to the Middle East, where Jerusalem was expected to fall to British troops under General Edmund Allenby. It was when he was in Jersualem (which fell to Allenby in December 1917) that Thomas came across the extraordinary figure of Colonel T.E. 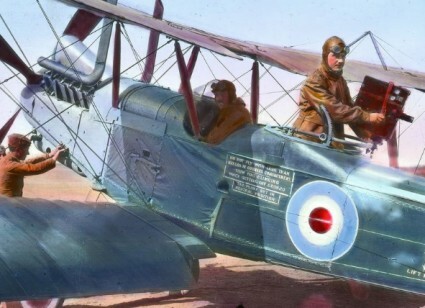 Lawrence, a British officer who was helping encourage an Arab revolt by all manner of unconventional means, including the wearing of Arab clothing. Thomas and his camera operator Harry Chase followed Lawrence for just a couple of days, taking both photographs and motion pictures. By this time, the purpose of Thomas’ expedition was really redundant, since there was no need to sell the idea of the war to American audiences any more, but once the war was over he organised his material into a form in which he could sell it as public entertainment. 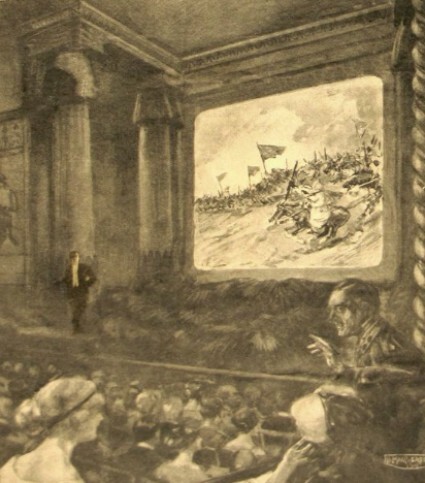 Thomas originally presented an amalgam of all his war material in New York in March 1919, where he found audiences responded most strongly to the Middle Eastern material. He moved to Britain with a show that was originally called With Allenby in Plaestine, including the Capture of Jerusalem and the Liberation of Holy Arabia. It was a truly multimedia show which Thomas billed as a ‘travelogue’ and presented himself (with Chase as projectionist). It combined live narration with music, lighting, lantern slides and film in a highly complex but slick presentation. Allenby was the great military hero, but it was the story of the incomparably romantic T.E. Lawrence, or Lawrence of Arabia as Thomas dubbed him, that captured the public imagination. Lawrence and Chase had spent little time with Lawrence himself, and had little substantial material to show (just a couple of film sequences taken by Chase showed Lawrence), but it was how Thomas told the tale that made the legend. The show premiered at the Royal Opera House in August 1919. Retitled With Allenby in Palestine and Lawrence in Arabia, it became a huge hit, tapping into an audience thirst for heroism away from the carnage of the Western front. The Lawrence tale seemed like a clean triumph replete with the values of another, more romantic age. Another major factor in the show’s appeal was how Thomas and Chase brought together word, image and music in a highly polished style we would now probably call televisual. 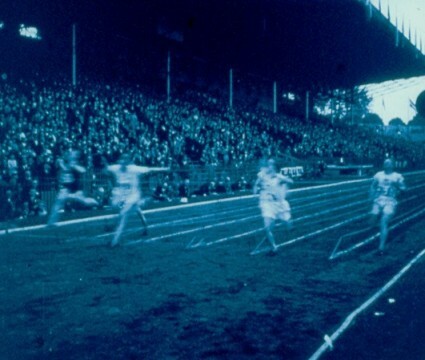 A million people saw it during its London run; four million around the world. It made Lawrence’s name, for good or ill, establishing a legend that he then tried to hide away from for the rest of his life. Thomas followed up the show with his 1924 book Lawrence of Arabia. He produced other travelogues based on further overseas adventures, and looked for other such modern-day heroes to match the success he had found with Lawrence (for example, the adventurer, aviator and polar filmmaker Hubert Wilkins) but never again did Thomas find so perfect a subject. The 1962 feature film Lawrence of Arabia (still in thrall to romance created by Thomas, by way of Lawence’s own self-dramatisation) includes the Lowell Thomas-like figure Jackson Bentley, played by Arthur Kennedy. It was an interesting experience trying to recreate the Lawrence part of the show at the British Silent Film Festival last year. Admittedly we only had a narrator, and actor, a PowerPoint slide show and video clips, whereas Thomas’ original show played in an opera house and featured an orchestra and a prologue with oriental dancers writhing before a backdrop of the pyramids. I felt that, though the show worked reasonably well as an entertainment, the script belonged to another age and was historically misleading. Others, however, still hold to the dream of remaking the show in all of its multimedia glory, and Rick Moulton is one of them. The Lowell Thomas and Lawrence of Arabia: Making a Legend, Creating History exhibition site is but a stepping stone to a document on Thomas and Lawrence and hopefully one day that recreation of at least the Lawrence part of the show (Allenby’s star doesn’t shine quite so brightly these days). We have the films, we have the images, we have the script, the music shouldn’t be a problem. But recreating the special presence of Lowell Thomas and still more an audience war-weary yet anxious for unsullied heroes may be that much harder to achieve. There is a detailed account of the reception of Lowell Thomas’ travelogue in London on T.E. Lawrence biographer Jeremy Wilson’s site. I remember Lowell Thomas on radio and television in the 1970s. It is hard to connect that man with the man who was filming the pyramids and following Lawrence. I can see why the Library of Congress had a hard time categorizing his biography. Thanks very much for the link. The hosting site, Clio Visualizing History, is pretty durned fascinating, too. Agreed, the Clio parent site looks very impressive. The exhibit on changes in the use of images for the study of history is thoughtful, well illustrated and well constructed. I’m not quite sure who their target audience is, though, as something like the Lowell Thomas site (which I rather admire) would seem to appeal to a more general audience than the more high-powered Picturing the Past.